Searching for a Pyrenean Sheepdog? The Pyrenean Sheepdog, not to be confused with the Pyrenean Mountain Dog, is an ancient breed from the Pyrenean region of France. It is a rare breed outside its home country so obtaining a well-bred puppy in the UK can prove to be challenging. Although it is devoted to all its humans, it develops the strongest bond with one particular person, usually the one that makes the most effort in taking care of it. Are you thinking of getting a Pyrenean Sheepdog? Here is a brief background of this alert and curious sheepdog. The Pyrenean Sheepdog, as the name suggests, came from the Pyrenean region of France. It is an ancient breed that was created as a hardy sheepdog that could endure challenging terrains and extreme weather. It was often paired with its cousin breed, the larger Pyrenean Mountain Dog, where the former herded the flock while the latter served as the guard dog against predators. Pyrenean Sheepdogs were taken to the USA in the 19th century originally as sheepdogs but later on became messengers and trackers of injured soldiers during the First World War. The breed is also credited to be the ancestor of the Australian Shepherd. Although recognised by most international breed registries, it is not that popular outside France and Spain. It is registered with The Kennel Club under the Pastoral group. The Pyrenean Sheepdog is a medium dog with an average size of 38 to 50 centimetres and 31 to 55 pounds. It exudes both energy and mischief that make it charming. Its head is almost triangular when viewed from above and its body is slightly longer than it is tall but still well proportioned. It has almond to oval shaped eyes that are dark brown or blue, a black nose with wide-open nostrils, a strong jaw with a perfect scissor bite, and short triangular erect ears. It also has a strong long neck, and a lean, strong and muscular body. When it comes to the coat, the Pyr Shep can have (1) a rough face, which is either long or moderately long and straight or wavy; or (2) a smooth face, which is moderately long with very little undercoat. Both coats are harsh, dense and flat. Those with long hairs may have natural cords. The dog’s hair on the rump and thighs are denser and woollier. Shorter coats have less fringing on the front legs and below the hocks. It comes in various colours such as different shades of fawn, black, brindle, grey, blue merle, black & white. The extent of grooming your Pyr Shep will depend on the length and type of coat but obviously, a dog with a shorter and closer coat is easier to groom. A weekly brush will usually suffice but brushing becomes more frequent during shedding seasons (spring and autumn). On the other hand, cords need to be patiently separated to look clean and neat. Aside from coat care, other grooming aspects include regular ear cleaning, tooth brushing, and nail clipping. The skin should also be inspected for abnormal spots and fleas. The Pyrenean Sheepdog is an alert, lively, mischievous, and inquisitive character. Although it loves all its human family members, it builds a super strong bond with only one person. It is not the best choice for first-time owners since it can prove to be a handful to some people especially those that are not used to active dogs. It wants nothing more than be busy and spend time outdoors. This breed is not for individuals with sedentary lifestyles. Early socialisation and training are key for this intelligent and fast learner. This means that the Pyr Shep can also pick up some unpleasant habits. Owners need to be the alpha and be firm yet gentle in handling this dog since it does not respond well to harsh corrections. If the roles and rules are not set, the Pyrenean Sheepdog will become domineering and difficult to handle. The Pyr Shep can be wary of strangers, although never aggressive. It is a great watchdog because it quickly alarms its owners of intruders. When it comes to children, it is loving and gentle. However, it can get boisterous and rough during playtime so adults need to be around to supervise. It gets on well with other pets including cats when they are raised together. A well-socialised Pyrenean Sheepdog also has no problem meeting new dogs but small animals and other people’s cats are a different story as it may be considered as prey. A typical serving for an adult Pyrenean Sheepdog is 1.5 to 2.5 cups of excellent quality dry dog food per day. Always put into consideration your pet’s age, build, size, activity level, and metabolism when it comes to meal timings and amount. If you are unsure, you can always consult a veterinarian. Since it is prone to bloat, measure its food and avoid free-feeding. Active dogs like the Pyrenean Shepherd will thrive on a diet rich in animal protein and the right amounts of carbs and fats. Steer clear of cheap dog food brands as they usually include artificial colours and flavours that can be harmful to your canine. Also include Omega 3 and 6 for a healthy coat. The Pyrenean Sheepdog is generally healthy and is known to have a long lifespan of up 17 years. However, it can still develop predisposed illnesses, which are worth knowing for better chances of living out its lifetime. They are bloat, Epilepsy, Hip Dysplasia, Luxating Patellas, Patent Ductus Arteriosus, and heart disease. This energetic medium dog needs at least 1 hour of exercise per day. If its exercise needs are not met, it can get bored and would find ways to amuse itself, which are usually destructive. Aside from outdoor walks and hikes, and free time at a fenced yard, include canine sports like agility and flyball into its day-to-day schedule. The Pyrenean Sheepdog is a rare breed in the UK so procuring a well-bred puppy can take a while. You will need to contact a breeder and register your interest so you can be put on a waiting list. The cost of a Pyr Shep puppy won’t go lower than £500 and insuring it will cost £20 to £40 a month for basic coverage, depending on your location and the dog’s age and health. Pet insurance is optional but it will save you from unforeseen expenses in case your dog gets sick. Other expenses include basic equipment like a bed, crate, leash, food and water bowls, toys, and others (one-time cost worth £200), food (£30 to £40 a month), and veterinary care costs for vaccinations, worm/flea treatments and routine check-ups (as much as £1,000 per year). Be ready to spend around £80 a month for the aforementioned expenses to care for a Pyrenean Sheepdog. 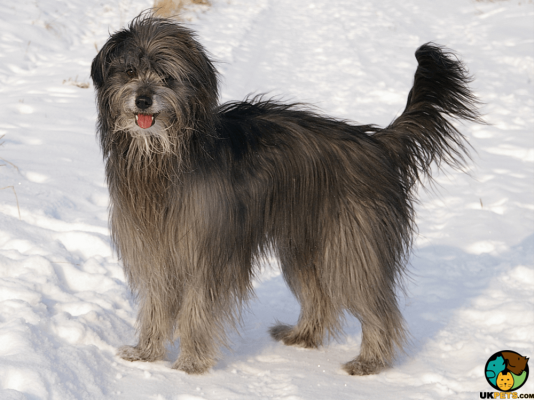 Is a Pyrenean Sheepdog Right for You? The Pyrenean Sheepdog is an alert and devoted canine companion. It thrives in a family that leads an active and outdoor lifestyle. It is not suitable for first-time owners. The Pyr Shep has a potentially long lifespan of up to 17 years. It is good watchdog because it is quick to alert owners of intruders.